As parents, we are constantly looking for products to make our lives easier, more productive and more fun. Sometimes we run across a product that is so simple in its concept, yet so brilliantly useful, that you kick yourself for not thinking of it yourself. You know, like sliced bread. Or Facebook. 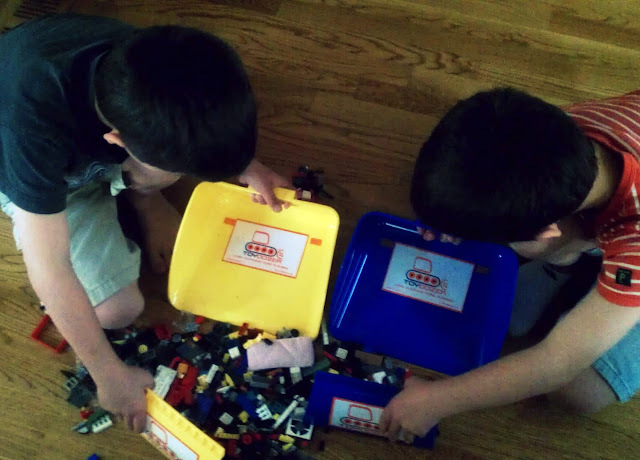 What if toy clean up could be a fun activity instead of a dreaded chore? Enter the Toydozer. This innovative new product makes clean up time fun, fast, and efficient for both parents and kids. With a few simple scoops, you can clean up huge amounts of toys at one time and easily dump them back into their storage bins. No more crawling all over the floor in search of every stray small piece. With a few swipes of the Toydozer, clean up time is over in no time. The Toydozer is available exclusively on the Toydozer.com website and comes in three vibrant colors: purple, yellow and blue. The product retails for $18.99 and ships for free anywhere in Canada or the U.S. The Toydozer acts like a brush and dustpan, but instead of a brush that catches dirt and hair and dust bunnies, you use a sturdy plastic scoop. You don't have to pick anything up, just swipe the scoop and guide all those little toys into the pan. It's such a simple idea, but it's brilliant. They even thought of providing velcro tabs, so you can attach the scoop to the pan and keep them together! One thing that would make the Toydozer even better would be a hanging hole or hook, so you can hang it on a wall for storage (there is a hole on the back "wall" of the pan so kids can grip it properly, but you can't really use it to hang the Toydozer). Use the code BLOGGER20 to get 20% off your purchase at Toydozer.com! One lucky Bonggamom Finds reader will receive a Toydozer playroom cleanup tool! Leave a comment on this post telling me why you'd like to win a Toydozer. 3) Share this giveaway on your Facebook page, with a link to the giveaway -- http://bit.ly/HRCfQ8 (1 entry). 5) Follow @bonggafinds on Twitter (1 entry). This giveaway ends at 11:59PM PST on April 16, 2012; I will draw a winner at random on April 17 and post the winner's name after the winner confirms acceptance. For additional giveaway rules, click here. Good luck! Disclosure: This post is part of a Toydozer blogger outreach campaign. Participating bloggers have been provided with a complimentary Toydozer to review and have been compensated for their time. Product information is provided by Toydozer and is indicated in italics. The views and opinions expressed here are my own. I'd like to win because my grandson constantly has a million pieces of building blocks scattered around and this would make clean up much easier and faster! I'd love to win because it would encourage my little one to clean up! I follow @bonggafinds on Twitter. My boys are very uninterested in cleaning up their toys so I would love to win this to help motivate them. This concept is inspired!